Her mother was a lifelong teacher, her stepfather a clinical psychologist. And from her earliest days, new Goizueta Business School Dean Erika James knew without question that she was destined to become a psychologist. But along the way, opportunity intervened, taking her life's work in directions she could have never anticipated. Instead of clinical psychology James became intrigued with organizational psychology, the study of human behavior in the workplace in addressing critical business issues, including recruitment and hiring, performance and productivity, and management. "In college I discovered that I really liked studying human behavior in a practical context, understanding why people behave the way they do and what motivates them," explains James, who until recently was senior associate dean of executive education at the University of Virginia's Darden Graduate School of Business Administration. After pursuing an undergraduate degree in psychology from Pomona College and both an M.A. and Ph.D. in organizational psychology from the University of Michigan, James built a career around sharing the benefits of that discipline with executive leaders and college students alike, all the while honing research interests in areas of crisis management and gender and racial workplace diversity. 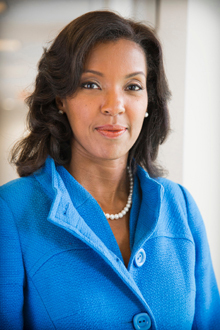 James, who stepped into her new role at Goizueta on July 15, reflects on how refocusing her ambitions has brought her to the helm of one of the nation's top business schools — to date, she is among only a handful of African American women to lead an elite U.S. business college. She replaces interim dean Maryam Alavi, now dean of Georgia Institute of Technology's Scheller College of Business. "I'm delighted to be here," James says. "The caliber of thought leadership that exists within our faculty is outstanding, and we have a tremendous talent pool in our students, who are primed to create the leadership of the next generation of companies." In coming to Emory, James values the opportunity to return to an academic setting that she knows well — she taught core organizational behavior classes at Goizueta in the late 1990s. After earning her Ph.D., James found herself weighing opportunities in both academia and business — having taken off time during graduate school to do management development work for American Express, she'd had exposure to both realms. An advisor urged her to try teaching, if only for a year. Twenty years later, James knows she made the right choice. "As I was graduating, I had an offer from Pfizer (pharmaceuticals) about the same time that Viagra was coming onto the market — and I turned it down," she says, laughing over the sting of lost stock options. "But I tell myself I'm much better off. Both my parents were teachers, so education was very much a part of my background and what I wanted to do with my life — a feeling that I was serving a meaningful purpose." After teaching at Freeman School of Business at Tulane University, James joined Goizueta as an assistant professor in 1998, where she began shifting her research focus. Initially, her research was inspired by obstacles she'd seen her mother encounter in her professional life. "She would have to leave an organization in order to get a promotion, but didn't find that to be the case for other people," James says. "I wanted to understand what that phenomenon was all about, the value of network relationships and how majority and minority individuals find support." While at Emory, James began collaborating with colleagues on issues of gender and women in executive roles, too. "At the time, there were a number of corporate crises going on (such as Enron)," she recalls. "Through my research, I discovered that when diversity became a challenge — often resulting in discrimination lawsuits — companies moved into crisis mode. So I started exploring that." After three years at Emory, marriage and job opportunities led her to the University of Virginia, where she has served as a professor, associate dean for diversity, and senior associate dean for executive education at the business school. During that time, James saw the campus become a living laboratory in crisis management when backlash erupted over attempts to dismiss President Teresa Sullivan — an experience that would become fodder for soon-to-be published research, James acknowledges. In her new role at Emory, James sees herself as Goizueta's chief ambassador, elevating the stature of the school for external constituents and attracting the best faculty, staff and students to ensure "a visibility that rivals any top 10 business school," she says. For now, James anticipates spending time exploring "the inner workings of the school, what matters to our staff and students," as well as building enhanced engagement with both alumni and the corporate community. And she's already in meetings about expanding campus collaborations between the business school and health sciences. "We have a good start there, but health care is the issue of this century and it's not going to go away. There is a tremendous need for the health care community to have strong partnerships with business — it affects so much of the economy," she says.